We are always excited to be able to share our studio and Rhone House space with the community. Events at Rhoneymeade have included homesteading and gardening talks, as well as local history. Please check back often for events. Guests will be able to walk up to them, touch them, look through them at the landscape from many angles, walk among them, and see several overlapping; creating an artistically interactive experience of Centre County’s rural beauty. Notice and celebrate the "common" landscape that we so often take for granted. Join us for our 3rd Annual Pig Roast Fundraiser! Childrens activities - vegetarian options - live music! Make us a stop on the Centre County Farm Tour! 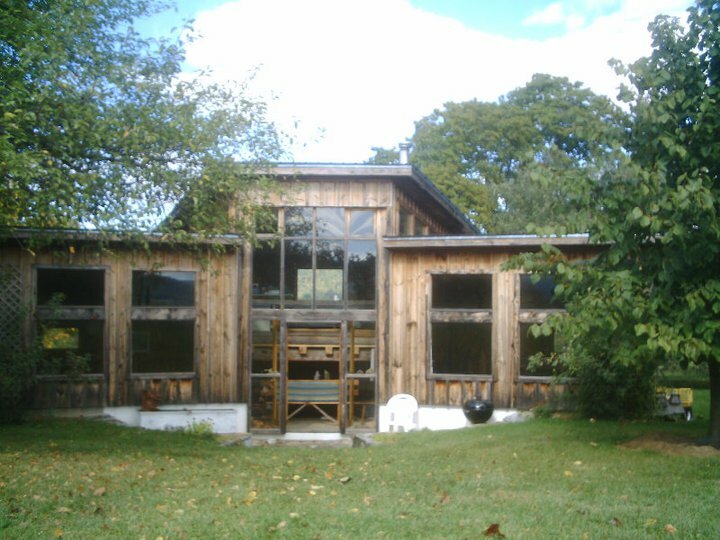 Tour our historic barn and learn about organic farming. Interested in learning more about Permaculture for regenerative land stewardship? Jackie Bonomo will go over the basics of Permaculture principles and how each is supplied to a site, useful mapping information as well as historical and cultural information for this site in particular. There is no charge for this workshop, but donations gratefully accepted. Looking for an art experience inspired by nature? Come out to Rhoneymeade for a week and enjoy working on a variety of projects with Beverly Crow, an experienced teacher and artist. Journey through the history of art, looking at the techniques and subjects of artists as diverse as da Vinci, O'Keeffe, Pollock, Matisse, Bearden, Delaunay, and others. Let the Rhoneymeade studio, grounds, and sculptures spark new ideas! The camp is for tweens and teens (11-18) and will run from 9:00 a.m. to 12:30 p.m., July 9 – 13. The cost is $125 for the week; some snacks and drinks will be provided, but please also bring your own peanut-free snacks to enjoy. Space is limited to 10 students, so register today! Looking for an art experience inspired by nature? Come out to Rhoneymeade for a week and enjoy working on a variety of projects with Beverly Crow, an experienced teacher and artist. These may include three-dimensional sculptures using recycled materials; painting and collage; shadow box frame painting; and mobile art. Let the Rhoneymeade studio, grounds, and sculptures spark new ideas! The camp is for tweens and teens (11–18) and will run from 9:00 a.m. to 12:30 p.m., June 25 - 29. The cost is $125 for the week; some snacks and drinks will be provided, but please also bring your own peanut-free snacks to enjoy. Space is limited to 10 students, so register today! Drop in between 1–3 pm for a Hammered Nature card workshop with Instructor Julia Nelson. Printmaking -- Sunday, May 13, Mothers Day! Art Alliance Instructor Ingrid Booz Morejohn will introduce you to the wonderful world of printmaking. Using simple methods and materials and with any skill level or age try your hand at creating a unique work of art called a monoprint. All supplies included. Join us in the garden for our Centre Gives fundraising event! Enjoy a relaxed evening of giving and socializing surrounded by an oasis of beauty. The Centre Foundation helps your donation dollars go further during their annual CentreGives event. donate between 7pm and 8pm, and help us win an extra $500 in prize money! This is a great time to renew your membership or to become a new member! For more information about Centre Gives, visit centregives.org/faq. Art Alliance Instructor & Student Show! Please join us for the Annual Art Alliance Student & Instructor Show at Rhoneymeade , May 5 to Sunday, June 3. This wonderful show features artwork by students and instructors at the Art Alliance from the past year. Surrounded by a mosaic of hedgerows, successional woodlands and forest, Rhoneymeade farm is 150 acres, certified organic (primarily hay), with a six-acre arboretum at its center. We will do about 2 hours of gentle hiking. Be prepared for a bit of mud if it is wet, but nothing extreme. We will look for a mix of returning breeders and migrants such as American Pipit, Blue-headed Vireo, Blue-gray Gnatcatcher, Ruby-crowned Kinglet, Brown Thrasher, Palm and Yellow-rumped Warblers, Eastern Meadowlark, etc. We will postpone to April 28 if rain is very heavy, but continue as scheduled with light rain. Rhoneymeade Arboretum and Sculpture Garden is 9 miles east of State College, midway between Linden Hall and Centre Hall. Follow route 45 E out of Boalsburg for 4.5 miles past the junction with 322, then turn left on Rimmey Rd. After about 0.3 mile of climbing up the hill, the road forces a sharp left. Small signs direct you to parking. Join tea aficionado Zoe Boniface for a tea tasting afternoon at Rhoneymeade. Sample ten unique teas and learn more about each. No tea party is complete without food – we will serve sandwiches and desserts typical of English tea-time.Come and enjoy a tea party with good food and good company! Learn the homesteading skill of butchering a pig and enjoy a simple Sunday evening meal in the historic Rhone House. will provide expert guidance as participants are instructed hands-on to cut pork halves into primal and retail cuts. Slaughter from previous day will be reviewed. Participants will receive a binder with cut charts, and have the opportunity to purchase some of the pork. Bring a cooler. $50 fee includes workshop, snacks, and simple dinner. Our time at Rhoneymeade was a very informative, casual and pleasant experience. The Executive Director was great, the Program coordinators were knowledgeable and charismatic... over all one of the best ways my Husband I have spent a Sunday!! — Participant from last years Hog Butchering workshop. Join us to learn from Bobby Hricko as he returns to give another apple tree pruning workshop. This talk and demo is suitable for anyone interested in pruning fruit trees, whether they have experience or not. Bobby is engaging and very knowledgeable. Welcome the holiday season at Rhoneymeade Arboretum and Sculpture Garden! Visit us December 9 & 10 between 10 a.m. and 4 p.m. Enjoy shopping in the Rhone House, and you're welcome to enjoy a quiet winter walk on the grounds as well. We are offering select handcrafted spoons, utensils, and shaker boxes made from a historic Rhoneymeade sugar maple salvaged by the talented woodworker Steve Strouse, as well as wreaths crafted from arboretum greens. Fill our beautiful handmade baskets in a variety of sizes with gift offerings of locally crafted items. Join us to take a break from the December frenzy and enjoy a moment of Rhoneymeade hospitality. Fall is here! Create your own autumn themed painting! Snacks and drinks are included as well and all necessary supplies will be provided for your use. At the end of the two hours you will have a finished piece of art to take home! Contact the Art Alliance at info@artalliancepa.org or call the office at 814-234-2740. Join us for a fall Pig Roast at Rhoneymeade! Demonstration by Steve Strouse how to bend wood to create a shaker box. Come see Steve Strouse's beautiful tables and mirros, created from local salvaged trees. We will also be offering very limited quantities of utensils, carriers, and #2 Shaker boxes, all created from a sugar maple salvaged from the Rhoneymeade Arboretum. If you join us for our October 14 Pig Roast - you will also be able to see Steve do a woodworking demo - focused on bending wood for his specialty shaker boxes. Signature Member of Pennsylvania Watercolor Society, Philadelphia Watercolor Society, Baltimore Watercolor Society. For the intermediate / experienced watercolor painter who would like to learn about painting on location, outdoors, "en plein air". 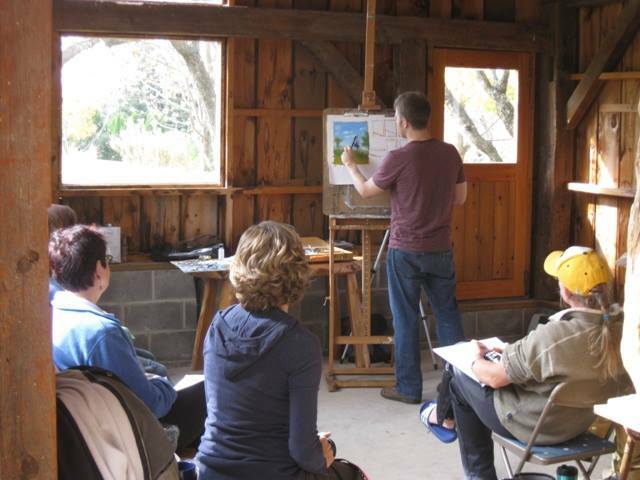 The workshop will cover tools and materials, selecting a dramatic composition, simplifying it, observing the light and shadows and experience how the paper and paint reacts when you paint outdoors. We will start and finish both days in the classroom. Lena will paint demos outdoors weather permitting. Students don't have to have tripods/ easels for outdoor painting. The garden has benches and chairs. Cut, layer, and stick to create a colorful mixed paper collage. Have fun learning to use a hammer to make hammered flower prints. Participants will have a chance to collect some plant material to use, as well as the flowers provided, to create botanical prints. You may bring some flowers or leaves from home to try, if you wish -- bold or dark colors are recommended. Cost for this pop-up is $15. Stacie Bird is a photographer who has lived and worked in Centre County since the early 1980s. She received a Bachelor of Arts degree from Penn State in Film in 1985. Her background in film making guides her photography and visual storytelling. "The mountain town of San Miguel de Allende in the state of Guanajuato is an oasis, rich in culture, religion, and politics, in the heart of Mexico. From the brutal beauty of the landscape to the warmth of the people, traditions and food, this vibrant city has held a large part of my heart (mi corazón) for the past 10 years. "These pieces speak to my love of the vibrant colors that are daily life in Mexico. From the simple adobe walls to the ornate colonial churches, the bold and saturated colors of the architecture are, at once surprising, always inspiring and ever-changing. "The simple beauty of everyday objects compel me to observe, record and share." Want to learn what birds have been recently sighted in your area — or in a place you’re planning to visit? John Smith, in consultation with Joe Gyekis, has created a site that integrates Google Maps, eBird, and other ornithological data. These experienced naturalists will demonstrate how the site works and show you how to use its maps and search functions on your own. If you're interested in birds and birding, come out to Rhoneymeade for this fascinating presentation -- and do a little birding on the grounds, too! White-breasted Nuthatch photo by Manjith Kainickara. Licensed underhttps://creativecommons.org/licenses/by-sa/2.0/CC-BY. Looking for an art experience inspired by nature? Come out to Rhoneymeade for a week and enjoy working on a variety of projects with Beverly Crow, an experienced teacher and artist. Collages, mobiles, sketchbooks, and more: let the Rhoneymeade studio, grounds, and sculptures spark new ideas! The camp is for tweens and teens (11-18) and will run from 9:00 a.m. to 12:30 p.m. For more information or to register, email Rhoneymeade at rhoneymeade@gmail.com. The cost is $125 for the week; some snacks and drinks will be provided, but please also bring your own peanut-free snacks to enjoy. Space is limited to 10 students, so register today! Come join us at Rhoneymeade to meet artist Pat Dolan and enjoy a demonstration of her work. Have fun learning to use a hammer to make hammered flower and leaf prints. Children will have a chance to collect some plant material to use, as well as the flowers provided, to create botanical prints. You may bring some flowers or leaves from home to try, if you wish -- bold or dark colors are recommended. For children ages 8 and up -- family members may enjoy exploring Rhoneymeade's grounds during their visit. Please note: participating children must be capable of using a hammer. Parents are welcome to stay to assist their child. In the event of inclement weather, the pop-up will be held indoors. Saturdays and Sundays throughout the month of July. Enjoy the beautiful paintings of our friend and local artist, Pat Dolan. Her current focus is on bird portraits. We'll provide the grill, you provide the picnic! Come to Rhoneymeade to celebrate Father's Day. We have tables, chairs, a fridge, a kitchen -- just bring your favorite foods and perhaps some utensils to cook with, if you need something special. We'll provide the grill, charcoal, paper plates, some seltzer to drink, and a gorgeous backdrop. Take a walk through the gardens after lunch and enjoy the scenery and sculpture. See you on the 18th! Come to the Rhoneymeade studio to see artwork by students in the Delta Program! There will be work in a variety of media -- including pottery, pencil and charcoal, and collage. You're invited to attend the opening reception for this exhibition on Sunday, June 11, at 1:30 p.m. The exhibition will run until June 25. Ever wondered about lawn alternatives for your home? Join Master Gardener Justin Wheeler to explore how to use native grasses and other groundcovers—from golden ragwort to various native sedges—in your landscape. Bring your questions and learn about the benefits of these groundcovers!